Prebiotics Market size was above USD 3.5 billion in 2016 and consumption may exceed 1.4 million tons by 2024. Increasing application scope in functional food and dietary supplements industry owing to growing emphasis on improving digestive health & increased concerns toward obesity should drive prebiotics market size. Increasing consumer awareness towards nutrition & dietary supplement intake along with growth in dairy consumption should favor product demand. Global dietary supplement demand was worth over USD 120 billion in 2016 and is expected to grow significantly owing to growing emphasis on consuming healthy food ingredients. These products are non-digestible food substance responsible to stimulate growth of favorable bacteria in the gut and contribute to wellbeing of the colon. These products are found in foods like bananas, onion, leek, wheat bran, cereals, table spread, biscuits and yogurt helping maintain health in humans and increasingly appealing to health-conscious population which should favor product demand. Global prebiotics market size expects significant growth within functional food industry owing to extensive application in dairy products, nutrition bars, weight loss products, mineral supplements, green food and health drinks. This growth in demand can be attributed to increasing consumer awareness towards nutrition, health and amplified focus on importance for essential ingredient in diet. Key raw material used in manufacturing process includes lactose, acacia gums, chicory roots and starch. Supply for these raw materials are ensured from countries like France, Belgium and Netherlands due to having large production base for chicory roots. Any fluctuation in raw material availability can affect prebiotics market price trend. Prebiotic inulin market size is poised to exceed USD 3 billion by 2024. Inulin is a soluble dietary fiber providing naturally forming oligosaccharide when passed through intestinal fermentation process, converting to healthy micro flora (Bifidobacterium). Inulin usage improves taste, texture and moisture in food products. 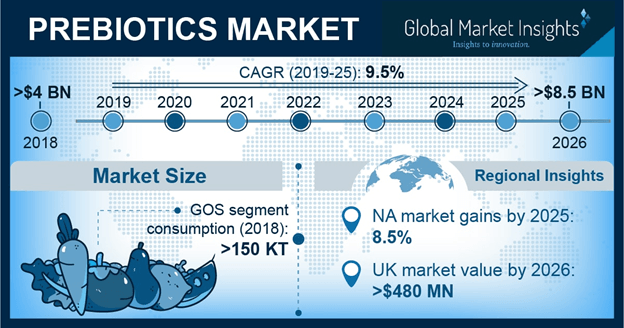 Galacto-oligosaccharide (GOS) prebiotics market size expects gains at over 9%. GOS contain mixture of substances produced from lactose, comprising between two to eight saccharide units one being terminal glucose and other saccharide units being galactose. The slight sweet taste makes this product useful as sweetener for infant and helps in improving mineral. Prebiotics market size from food & beverage applications should surpass USD 7 billion by 2024. These products find extensive application scope in dairy, baked foods, dry foods, cereals and fermented meat products. Its demand from dairy applications expects gains at over 9%. Increasing concern towards lifestyle diseases which includes diabetes & obesity particularly in Europe and the U.S. should drive product demand for dairy applications. Fermented meat product applications should witness significant gains at over 13%. These products are used in meat industry as they improve fiber functionality, fat replacement and enhances stability & texture. It is mostly used as it also improves water binding capacity and emulsion of the meat product. Prebiotics market size from animal feed applications is anticipated to grow significantly during forecast period surpassing USD 800 million. Rise in global meat consumption and ban of using antibiotics as growth promoters in animal feed should boost product market size. Poultry and cattle are the most lucrative segment in animal feed market due to growing demand for healthy and safe meat products. North America, led by U.S. prebiotics market size, expects to surpass USD 950 million by the end of 2024. Change in dietary preferences has led to rise in dairy and meat product consumption coupled with stringent rugulations against using antibiotics growth promoters (AGPs) which should drive regional product demand. Europe prebiotics market size, led by Germany, France and Italy, expects gains at over 9%. This growth can be attributed to extensive application of these products in food & beverage industry, which should contribute towards growth in packaged food demand due to busy work life schedule in the region. Asia Pacific, led by India, Japan and China prebiotics market size, should witness significant growth rates. Increasing application scope in animal feed owing to growth in meat consumption for protein intake along with nutraceutical industry growth in the region should propel product demand. Global prebiotics market share is moderately fragmented and some of the industry participants operating include Cargill, Friesland Campina, Beneo GmbH, Abbott Laboratories and Yakult Pharmaceutical. The industry expects further consolidation in form of mergers & acquisitions. This strategy may enhance company product portfolio and increase their regional presence. In February 2016, FreislandCampina and Glucosyn collaborated to develop new infant nutrition formula which contain HMO’s, which can strengthen its position in market and region. Glycosyn has patented for mnaufacturing oligosaccharides from lactose. Prebiotics are ingestible food and feed ingredient mostly used in food & beverage and feed industries. Consumption of these products facilitates growth of bio-culture in gut which remains unaffected during digestion process and improves digestive system in humans and animals. It boots bacterial health including lactobacilli & Bifidobacterium along with providing resistance to pathogens. Inulin is commonly found in food which occurring in plants containing fructan. Consuming these products helps in controlling blood cholesterol level, lowers CVD risks, maintains hormonal balance, improves digestion and lowers risk for obesity.